Austin Grossman has a new novel out. It just hit last week, and it’s called YOU. YOU is like Ready Player One and Fight Club having a baby while making an Ultima game. If you’ve read both of those books (or watched the movie, in Fight Club’s case) and liked them, do not pass go, do not go to your cave and find your power animal, buy this book and read it. 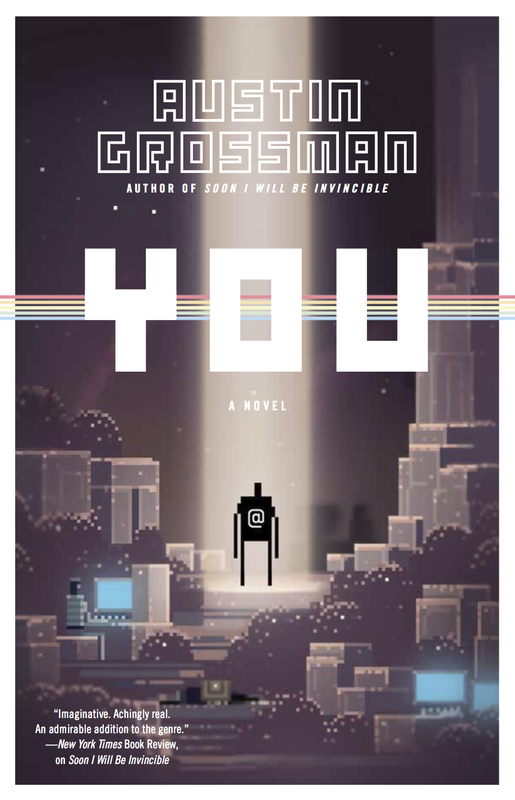 YOU is a book about making computer games, about making the Ultimate Game, a game where you could be anyone and do anything and the world would still work, the story would still unfold completely naturally. Austin has worked as a writer and designer on some of my favorite games, including Deus Ex and Thief: Deadly Shadows. His experience in the games industry really shows, and you can see bits of real games peaking through the imaginary ones. There’s a section in the book about a demo at E3, and it sounds exactly like they’re playing Thief, scrambling over rooftops, firing flaming arrows at torches, evading the city watch. Austin’s latest game is Dishonored, which is sitting on my shelf, and has now risen much higher in the next-to-be-played list. The story of YOU is told through a prodigal protagonist. Out of options, he returns to the game company his friends started after high school, after they all built a pair of RPGs together. He gets a job as an entry-level game designer, and proceeds to unravel a mystery about friendship and adolescence and being a nerd. The game shifts between its present day of 1997 and the 80’s years of high school, the story unfolding through flashbacks and dives into the games the company created. If you read REAMDE and enjoyed the parts in the MMO, or if you enjoyed Daemon, or Ready Player One, or Tad William’s Otherland books, you’ll like this book. It’s obvious he’s writing from experience when he introduces a game, and while some of the details may be embellished from what was possible then, they play like we want to remember them. The ending of this book doesn’t land as well as it could, it doesn’t leave you with a particularly warm sense of accomplishment, but it isn’t bad. The macguffin is resolved, but the mystery sort of peters out. This isn’t a book you read for the ending, though, it’s a book you read for the journey, for the time warp back into high school, into games on floppy discs and BBSes and a million possibilities inside the magical machine that no one over the age of 25 understands. As an ode to that bygone era, it is unmatched. This entry was posted in Reviews and tagged game design, rpg on April 22, 2013 by Jeff Kramer.